My husband and I had been married for 6 years when we felt it was finally the time to start trying for a baby. I was concerned that it would take us a while to conceive since my cycles were always screwy. Boy was I surprised when in Jan 2005, just after one month of trying I received a positive pregnancy test. We were elated. My dream of becoming a mother was finally coming true. We of course told everyone we knew. Our families and friends were just as excited as we were. My pregnancy was pretty smooth. I was having some mild morning sickness and some food and smell aversions, but other than that everything was great. Because of insurance issues I wasn’t able to see my OB until 12wks. My husband and I were so excited to see our baby and the little heartbeat. Our appt was routine, all the questions, all the books and info every new parent gets. Then we went back for our u/s. They did a vaginal ultrasound and being a newbie I had no idea what was going on. I just remember lying there waiting for the tech to say something and then she did, words that will forever haunt me…”This is not a good pregnancy, there is no heartbeat”. My world fell apart. I couldn’t believe what I was hearing. The baby was only measuring 10.5wks. I had a D&C two days later. I really didn’t know how I would be able to go on with life after losing my baby. Eventually the day came when I thought I was ready to try again, and try we did. After being unsuccessful for 9 months I saw my OB. She prescribed clomid, progesterone and estrogen. On my second round of clomid I got a BFP. Unfortunately, I started spotting that same day and miscarried that baby at home on 2/13/2006. After 3 more unsuccessful months I decided to see a RE (reproductive endocrinologist). After much testing she diagnosed me with PCOS and had me do more clomid cycles, all of which were unsuccessful. By this point I was so depressed and exhausted that I needed to take some time off from TTC. In February of 2007 I decided to return to my RE for more treatment. We did another clomid cycle and amazingly it worked. I was pregnant for the 3rd time. I was determined to enjoy this pregnancy in spite of how the other two had turned out. Family, friends and our whole church were praying that this baby would make it. We were thrilled that we were finally pregnant. Since I was seeing an RE I started having scans at 6wks. The first u/s didn’t go great. There was a tiny flicker of a heartbeat, but we were not able to here it. My RE stayed optimistic and said it was probably still early and to come back in 3 days. Three days later there was no heartbeat. I was carrying another dead baby. My heart was broken into a million pieces all over again. I had a D&C 3 days later on 4/10/2007. The doctor sent the baby off to have testing done to see if they could find any reason this kept happening. All those tests came back negative. Which in a way was good because it meant we didn’t have a genetic defect we were passing on, but in another way it wasn’t good, it left us with so many unanswered questions. We tried the clomid a few more times. It worked once again but this time it was a chemical pregnancy. If I hadn’t had a blood test done I wouldn’t of even known I was pregnant. I decided I need to take another TTC break. I also decided that I need some anti-depressants. Four miscarriages was more than I could handle on my own. I know that one of the main reasons I survived was because of my faith. I knew that all of my babies were with God in heaven and one day I would get to meet them all. But it was still hard for me to understand why this kept happening. In February of 2008 I returned to my RE. This time we decided to do IUI with injectible medications. I would also be on progesterone, metformin, baby aspirin and give myself daily shots of heparin once I was pregnant. By the grace of God the IUI worked and I was pregnant. I again was determined to enjoy every minute of this pregnancy even though it was excruciatingly hard at times. I started having scans at 6wks and everything looked great. There was a heartbeat, something I had never heard before. At my 8wk scan the dr noticed a hematoma but wasn’t concerned. I spotted most of the next day, but she said it was because of the hematoma. The spotting only lasted a day so I wasn’t concerned either. At 8wks4days I woke up to get ready for work. I wasn’t feeling great. My abdomen was hurting, but it felt like a GI pain. So I decided to lay down and see if that helped. I felt that I needed to go to the bathroom so I called my husband to help me to the bathroom. The next thing I remember is lying on the bathroom floor with my husband saying my name. I had passed out and he had called 911. The ambulance came and rushed me to the hospital. I lay in the most excruciating pain I have ever felt for the next 2 hours. I couldn’t get any pain meds until I saw a dr. It wasn’t until I passed out again that dr finally came in. They sent me for an u/s. Once we were back in the room the dr told us it looked like I had a cyst that had ruptured and my abdomen was filling up with blood. I needed emergency surgery. Everything after that was a blur. It all happened so quickly. I was wheeled off to surgery and the next thing I remember is waking up in recovery. My husband and friend came in to see me. 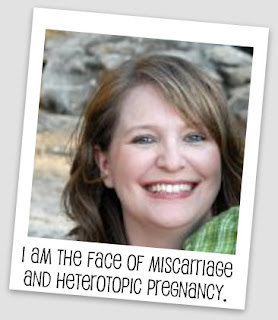 They told me that I had a heterotopic pregnancy. I had one baby in the uterus and one in my tube. My tube had ruptured and I had 1.5 liters of blood and clots in my abdomen. They were able to remove everything and left my uterus untouched (thus leaving that baby unharmed). I had just lost my 5th baby, which also happened to be my son’s twin. While recovering from surgery I continued to have weekly scans and my Turkey baby was doing fabulously. The rest of my pregnancy was thankfully uneventful. I delivered my son on 11/17/2008. I am so blessed to have my son here with me. But his life does not negate the lives that came and went before him or all the hopes and dreams I had for each of them.. They are my children and they will always be missed and loved. Thank you for sharing. How gut wrenching this was to read. I am just pouring tears. I am so thankful GOD has given you your son! GOD BLESS YOU!! !